This tape is a way of taking one's advanced push hands training into a realistic physical realm. We firstly take push hands into a completely reflex way of training so that the movements become sub-conscious. 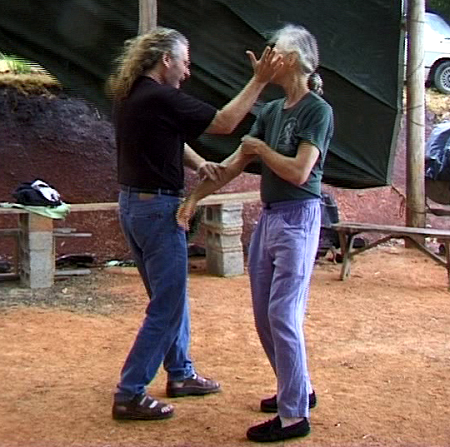 Then we use the ten training applications of sudden violence from Push hands to add to this abstract way, a more physical way of using push hands in order to join the sub-conscious to the physical. Ten applications from within push hands using the p'eng/hinge method of push hands does this for you. Very deadly and very useful both for training and for real self-defence.